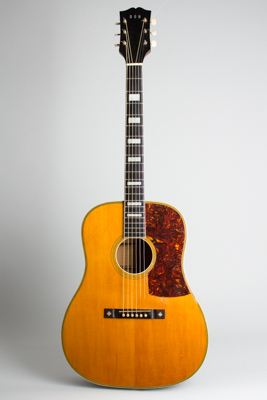 Euphonon Dreadnought Model Acoustic Guitar, made by Larson Brothers, c. 1938, made in Chicago, natural top, sunburst back and sides finish, maple back and sides, spruce top; laminated maple neck with ebony fingerboard, period hard shell case. This wonderful Euphonon Dreadnought is easily one of the finest surviving 1930s Larson Brothers instruments we have seen, a true gem of a pre-war Jumbo and a fantastic instrument for any era. It was built originally for Doyne "Don" Wilson of the Hilltoppers, Chicago radio station WLS artists around 1938, and bears his name on the headstock. The story we got is it was for some reason never picked up by him, instead sitting unclaimed in the brothers' shop. Subsequently it was sold to another local player, apparently a more jazz-oriented musician who used it very little and the guitar ended up in the Music Emporium in Pittsburgh in the '60s or '70s; their paper label is visible on the inside back. It has subsequently been in a private collection for many years. This guitar carries the Euphonon brand on the backstrip, the last of several names the Larsons used for their wares. August and Carl began using this name in the 1930s, and the majority of guitars so branded show "modern" features: a 14-fret neck joint, slimmer neck, solid, non-slotted peghead, and often larger bodies. All Larson instruments were handmade, but in this era each one is unique. In the 1930s the brothers' Elm street shop functioned (in modern terms) as a custom shop, building one-offs for direct sale to the customer. Anyone could go to the Larson shop at 536 Elm Street in Chicago to order an instrument. August Larson is even remembered as saying "you already have a guitar...why do you need another?" In the 1930s many entertainers felt they needed bigger, flashier guitars. The Larsons were at the time the only major individual builder specializing in the fancy flat-tops preferred by "Hillbilly" entertainers, including Martin-style Dreadnoughts. This guitar shows the Larsons adapting Martin's design to create something unique. Instead of the traditional Brazilian rosewood or mahogany, the body is curly maple with a lovely subtly shaded finish. The spruce top has the laminated X-bracing and subtly arched "built under tension" design the brothers developed 30 years before, ideally suited to this large-bodied design. Guitars of this period arguably show the structural and tonal advantages of August's innovations better than the smaller instruments of previous decades. The top is multi-bound, with a large inlaid celluloid pickguard on the lower half of the face. The Larsons' signature rosewood bridge has clover inlay at each end. The laminated maple neck has a bound heavy ebony fingerboards inlaid with pearl blocks; the headstock is plain except for the name "DON" in pearl block letters. Don Wilson, for whom this guitar was almost certainly built, played standard and Hawaiian guitar as one of The Hilltoppers on WLS. Like many WLS performers, The Hilltoppers' once radio-driven celebrity is now only a footnote to country music history. Larger body Larson guitars with 14-fret necks are generally considered the cream of the Larson crop. With slimmer, more modern-feeling necks, they are very comfortable to most players. The built-under-tension construction helps create a quick response and bright, ringing tone with strong sustain even in a large guitar. Many consider the 16" Euphonons the finest-sounding of all Larson instruments; indeed, some of the best steel-string guitars ever made. This unique pre-WWII maple Dreadnought is certainly a contender! Overall length is 41 1/4 in. (104.8 cm. ), 15 3/4 in. (40 cm.) wide at lower bout, and 4 5/8 in. (11.7 cm.) deep. Scale length is 25 1/2 in. (648 mm.). Width of nut is 1 3/4 in. (44 mm.). This guitar remains in far more original condition than most extant large-body Larsons, with some light repair but substantially intact as the brothers originally built it. There is a very thin lacquer overspray over much of the instrument, most noticeable on the neck and headstock. The top appears to have the least, although a couple of filled dings indicate a minimal degree of overfinish. The neck also appears to have been cleanly reset. This work all looks to have been done quite some time ago, and there is subsequent light pick wear through the finish mostly around the pickguard and some dings through as well. The bridge, the thin maple bridgeplate, and even the composite bridgepins are completely intact -- this is rarely the case after 80 years! The top center seam behind the bridge has been resealed but there are no cracks visible anywhere. The frets and fingerboard remain original and unaltered with only very light wear. The tuners are the original open-back Waverly units with plastic buttons and hexagonal grommets. The name "DON", inlaid in the headstock, was finished over at one point, and has re-emerged with minimal evidence of this work. This is certainly one of the finest surviving Larson WLS guitars, with far less use and repair work than most. These were working tools for the original owners, and most have been heavily worn and often altered by subsequent repairs over the course of their service. The maple Dreadnought is a rarity in any era, and this is a unique instrument of its type. It is a great-playing and spectacular-sounding guitar, brighter than any similar Martin with the cut of an archtop and the deep power of the Dreadnought combined. It also includes the original hard case, something else almost never seen with Larson instruments. Excellent Condition.